Multiple buyers of Apple’s new HomePod speaker, including websites like The Wirecutter and Pocket Lint, are reporting that leaving the speaker on top of a wooden table can cause a white ring to form. According to The Verge, Apple has already acknowledged the issue, stating that “the marks can improve over several days after the speaker is removed from the wood surface”. 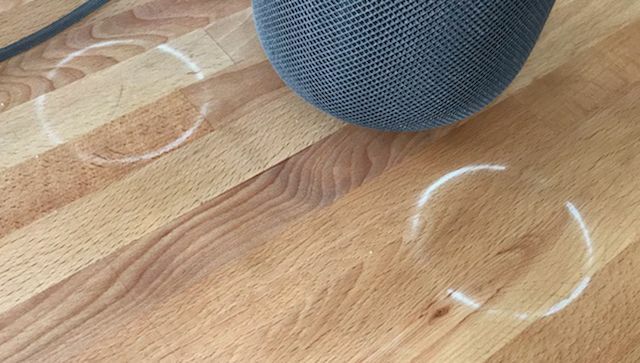 Apparently the silicone base of the HomePod is causing these stains to form on wooden furniture. Apple has recommended that users should try cleaning the wooden surface with the manufacturer’s suggested oiling method if the white rings don’t fade over time. It must be noted that HomePods are not meant to be put on a soft surface because of its down firing tweeters. Hence the problem can’t be solved by just putting a cloth underneath it. As of now, there is no word on whether or not Apple will be taking steps to fix this problem, or possibly offer to replace units. In the meantime, try to keep your HomePod far away from any wooden furniture. Has your HomePod left a white ring on any of your furniture? If yes, did you manage to wipe it clean?